I love to weed–there are few activities that produce such instantaneous and satisfying results. Someday I’d like to write a book, a very long one, about weeding. I’d describe the root structure of every type of weed I’ve ever encountered and then explain the best tool and the best method for removing it. And the best time of year as well–for example, now is the time to remove mustards such as cress and garlic mustard, which go to seed very quickly. Below are just two common weeds and a description of their root structure and why it’s difficult to remove them. And don’t get me started on the many different species of grasses and their different roots. 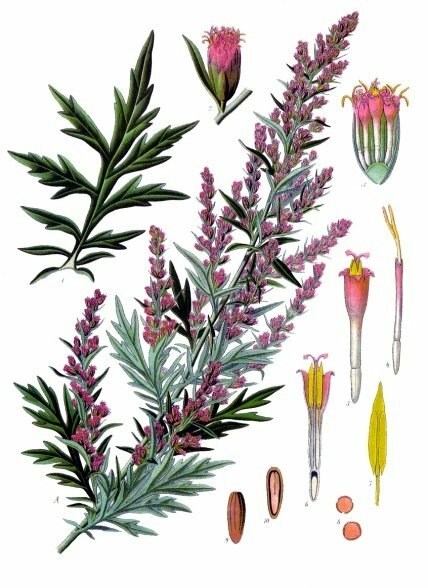 Mugwort, Artemesia vulgaris, spreads by rhizomes. If you just pull it, the roots remain and the plant grows back vigorously. The plant is not nearly as pretty as this illustration makes it look! Chickweed, Stellaria media. No rhizomes, but fine, hairlike roots that spread widely and break when you try to pull the plant out. Of course, there’s a new horticultural school of thought that says you should never pull weeds out–instead, you should simply cut off the top growth. If you do this repeatedly, the plant will die, but “repeatedly” is the key. It can take two years, so imagine doing it in a large garden! I have had success with this method for hostas–it took dedicated weekly removal of all foliage for two years. But I only had a few hostas leftover from the previous owner of my property. And even that was certainly easier than digging out large hostas with enormous root systems. A book on weeding would have a chapter on the definition of a weed (not violets! ), types of root structures, weeding methods, weeding tools, things not to do (black plastic, chemical herbicides), and a very long appendix listing weeds of the northeast, with photos of the plant and of the root structure. Somehow I don’t think it’s an economically viable project. This entry was posted in environment, garden, sustainability and tagged chickweed, common weeds, garlic mustard, mugwort, weeding. Bookmark the permalink. Purslane is edible as a salad green as well.